Still an Eton Mess really but the rosewater, pistachio, raspberry and basil combination is delicious! Whip the double cream, icing sugar, vanilla seeds and rosewater together in a mixing bowl until you have soft peaks (about 3 minutes but watch it carefully). To make the sauce, mash the raspberries to a purée with the icing sugar, rose water and lemon juice in a bowl until the mixture is totally smooth. Pass through a sieve to remove the seeds. 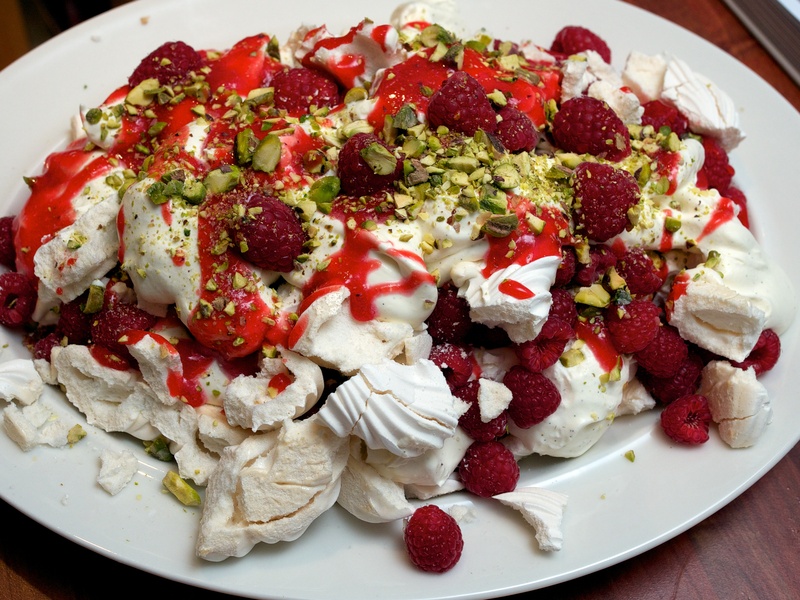 Layer the cream, meringues and raspberries on a large serving plate, drizzling the sauce and scattering over the basil and pistachios as you go. Decorate the top with a drizzle of sauce, and a final scatter of basil and pistachios. Serve immediately. Wow looks yummy and fresh. This looks wonderful, a great idea!